Discussion in 'Fixed Blades' started by dancom, Nov 28, 2018. Christmas is less than a month away. What's everyone working on? I am spending my coffee break at work touching up this present for my bro. 9.5" overall length, 154CM with stabilized maple scales. cuatroXcuatro, krash-bang and Kevin Cox like this. I thought all the knife makers had quit making knives (nobody is posting anymore). What ever happened to Roman ? I’m working on building a new surface grinder should have it done on my next two week home. I sent 27 big ones to heat treat last week. I think Roman post on Instagram. Love the wood in that handle. Beauty knife Dan. I sort of have been feeling guilty about not making knives for the last couple of months. I still participate in the forum but I haven't made anything recently, other than that small woodcarving knife. It sort of feels wrong. I've always been slow and definitely don't really sell anything but, you couldn't pull me out of the shop a year ago. I am currently sidetracked doing some woodworking. Christmas gifts and some projects I owe my wife and others etc. I'm also a bit absorbed with woodcarving right now. I have my Sayber about 60% finished and I'm really missing it. I will, inevitably, get back into the shop this winter but likely after the holidays. It seems to be my preferred time to make knives. I have also been playing with a new 3D printer, trying to figure out how to model things and playing with various print media. I'm finally having to catchup on all the things I've ignored over the past year or so. I have been trying to sell my house and in getting a new one, setting up a shop of some sort there. That never happened so I am thinking that it is time to go back to the old unload my stuff off the cart and put it back on when I am done deal. I have all the equipment and lots of steel so might as well try to use. My wife has asked me to make a couple paring knives for her so that might be my gateway back into things. I still come on here daily to see what everyone else is doing though. I have been honing my leather tooling skills on a gun sling. That is very nice. Someone's dad is going to be thrilled. Hasty pictures didn't clean up the blades of fingerprints etc but you get the idea. krash-bang, Kevin Cox and dancom like this. Very nice. I love the colours on the handles. I don't know how you guys are finding the time so close to Christmas to work on knives. If I got caught not cleaning something while sitting idle for 3 minutes, let alone spending time in the shop, they'd never find my body I think. Of course, we are hosting the entire family this year. 4X4 did you put some a scalloping along the blades? Looks great! What wood did you use on the red and black ones? Like there's not much to do this time of year...Doh! 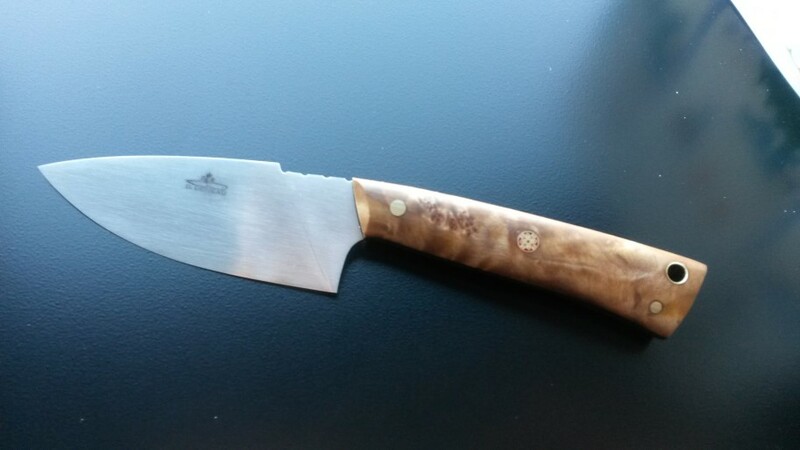 I recently finished this KN59-1 7 3/4" Chef's Knife from CPMS35VN stainless steel and stabilized maple burl handle. Burl is from scales I processed earlier in the year. Pins are black micarta and mosaic. Making some sort of presentation before next week. krash-bang and cuatroXcuatro like this. Dual hollow grind on the bottom knife, single above the cutting edge on the upper one right side only. Wengue and stabilized padauk. I've got a couple damascus blades to finish, 3 nessmuks to get out and I want to start on a whole kitchen set for myself. got parts for a HT oven coming and parts being waterjet for another grinder... lots to do! Man you sound busy. Nothing like taking on a bunch of projects to start the new year!